The African Cities Reader is a creation of Chimurenga Magazine and the African Centre for Cities, edited by Ntone Edjabe and Edgar Pieterse. The African Cities Reader is a biennial publication that brings together contributors from across Africa and the world to challenge the prevailing depiction of urban life on the continent and redefine cityness, Africa-style. It is a joint creation of Chimurenga Magazine and the African Centre for Cities at the University of Cape Town, edited by Ntone Edjabe and Edgar Pieterse. In many senses African cities are amongst the most generative and vibrant places on the planet. Yet, next to nothing is known about what goes on in places – not that there is any shortage of caricature, hyperbole or opinion about what makes African cities such quintessential spaces of dystopia and atrophy. The project arose from the belief that a range of interventions seeking to engage the shape-shifting essence of African cities is long overdue. This initiative is one contribution to a larger movement of imagination to redefine the practical workings of the African city. For the editors, it is self-evident that one has to take the youthful demographic, informality and a non-conventional insertion in global circuits by African urbanites as a starting point for a sustained engagement and retelling of the city in contemporary Africa. The cultural, livelihood, religious, stylistic, commercial, familial, knowledge-producing and navigational capacities of African urbanites are typically overlooked, unappreciated and undervalued. The African Cities Reader aims to bring their stories and practices to the fore, and become a forum where Africans will tell their own stories, draw their own maps, and represent their own spatial topographies as it continues to evolve and adapt at the interstice of difference, complexity, opportunism, and irony. The third and latest installment of the Reader explores the unholy trinity of land, property and value – the life force of cities everywhere. In an era of late modernity marked by a speculative compulsion that takes on a spectral character as it instigates adventures of city imagineering, deal-making and symbolic reinvestment, the material effects are often displacement, violence, daylight robbery and yet another round of elite seduction. The incessant (re)making of the African city is a game that leaves few untouched or unmoved and literally prepares the ground for the inhabitation of another 400 million urban dwellers over the next two decades. In this issue António Andrade Tomás picks through the post-independence architectural ruins of Luanda and reveals the vice and violence that permeate the act of securing land and home in a city greased with the ‘devil’s excrement’; Andile Mngxitama challenges the historical and contemporary rhetoric that positions land theft in South Africa in the realm of material dispossessions and asks us to plumb deeper to discover the narrative of loss that is the black experience; Billy Kahora reflects on the state of the ‘estate’ of his Nairobi childhood and finds its decay symptomatic of the malaise of a middle class that has lost its mind; and a transformative vision for the Lagos National Theatre is presented in four conversations and seven performative pamphlets. Other contributors include Maud De La Chapelle, Armelle Choplin, Marion Broquère, Simon Nancy, Jean-Christophe Lanquetin, Jumoke Verissimo, Adolphus Opara, Ayodele Arigbabu, Hunter And Gatherer Collective, Jahman Anikulapo, Koni Benson, Faeza Meyer, Sean Christie, Anne Pitcher, Marissa Moorman, Göran Dahlberg and Matthew Wilhelm-Solomon. African Cities Reader III is available online. The second installment of the Reader is centered on the theme ‘Mobilities and Fixtures.’ In this issue, Sean O’Toole interviews architect David Adjaye about African cityscapes, snapshot photography and failed utopias; Victor Lavalle uncovers the making of mercenaries in Uganda; Martin Kimani follows the African visa-seeker in the tragi-comedy that is the post 9/11 airport; Sherif El-Azma explores Cairo by foot; MADEYOULOOK and Santu Mofokeng imagine the didactic possibilities of trains; Manu Herbstein documents the ‘car-doctors’ of Accra; Chris Abani discovers the African city of Las Vegas; and Michael Watts examines oil cities. Other contributors include Jonny Steinberg, Brian Chikwava, Dominique Malaquais, Mowoso Collective, Doreen Baingana, Teju Cole, Ed Kashi, Sean Christie, Khulile Nxumalo, Nicole Turner, Iain Chambers, Tim Cresswell and many more. African Cities Reader II is available online, as well as in print. The first installment of the Reader brings together contributors from across Africa and the Diaspora to challenge, examine and critique the prevailing depiction of urban life on the continent. The theme, Pan-African Practices, is explored from multiple vantage points to produce a fresh look at the trajectories and interiorities of the urban African experience. In the launch issue, Rustum Kozain muses over the cultural and alternative relations built, negotiations and dealings made as a resident of Cape Town (South Africa); Jean-Christophe Lanquetin’s SAPE Project is captured in a pictorial narrative; Gabeba Baderoon and Karen Press poetically expound on the daily traversing of the personal and the (institutional) impersonal; James Yuma investigates the intersection between religion and national narrative in the Democratic Republic of the Congo whilst Valentine Cascarino asks how would a recontextualisation of Kinshasha in Johannesburg (South Africa) fare? ; Annie Paul explores the practice of death and burial rituals in postcolonial Jamaica; and Vyjayanthi Rao, Filip de Boeck and Abdou Maliq Simone discuss Kinshasa’s Invisible City and other African cities. Other contributors include Chris Abani, Akin Adesokan, Leslie Lokko, Achal Prabhala, Allan Kolski Horwitz, Marcus Neustetter, Jyoti Mistry, Rustum Kozain, and Ashraf Jamal amongst others. The African Cities Reader is a collaboration between the Africa Center for Cities and Chimurenga. 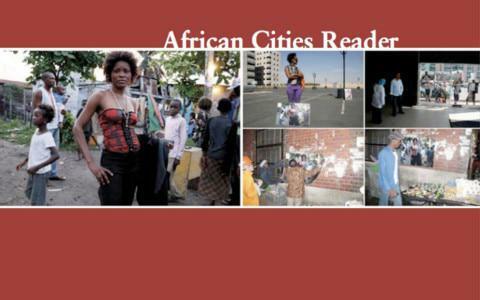 The African Cities Reader was edited by Ntone Edjabe and Edgar Pieterse. African Cities Reader I is available online and in print.